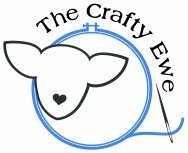 The Crafty Ewe is thrilled to have Bonnie Safran of Valley Framing provide custom framing services to our customers. Bonnie has been framing professionally for over 20 years and is exceptionally good at framing needlework. She's a stitcher herself so she appreciates how the right frame (and mats or fillets) can enhance the beauty of your work. In addition to needlework, Bonnie frames prints, artwork, t-shirts and more. Stop in during regular shop hours and let us help you pick out just the right frame for your piece. Or call Bonnie at 330-483-7050 to make an appointment.